Actually I cut my bangs two weeks ago and I feel so regret, this is the shortest bangs I've ever had. I feel short bangs are the biggest mistakes I made, I hope my bangs grow rapidly. And I can't wait to coloring my hair again. 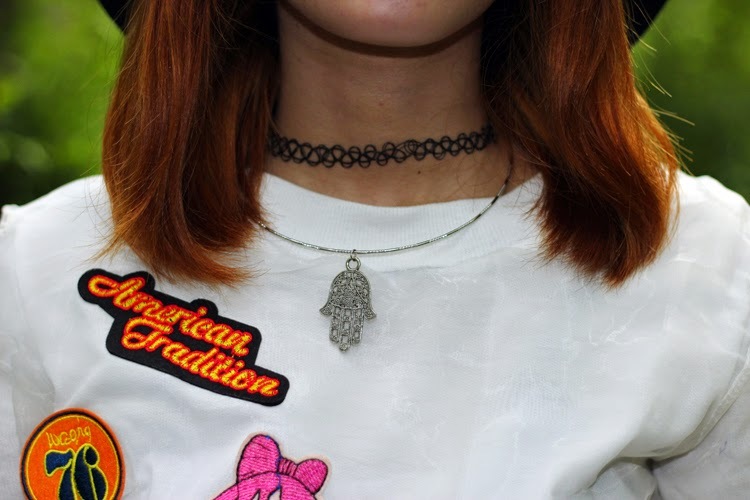 Yesterday I wore all in white outfit, got the tshirt and short on my favorite webstore, I'm in love with all the patch on my shirt and the short. And here's my edgy outfit. Finally I'm so happy 'cause I got my Adidas Superstar last week, feel so lucky, you know it's so hard to find my size, ok, my shoe size is 6, and been looking for it for a long time. The sad thing is, I lost my grey shirt, after the shoot I put the shirt in my bag, but when I got home I just realize that I lost it, it's new and I never wore it before, oh well..
Hi Dear. Great outfit ;) Lovely blouse! i really like the sunnies! U look cute with the bang, srly !! I love your patched tee with the sneakers Rin! Such a cool outfit! Nice to discover your blog. Great look, love your tee! You look amazing! I'm loving the hat. Awesome top, i like all those stickers! That top is beyond cute! I love this. Really pretty outfit! Love the last shot! Love your style and your photography ! Omg!!! Your style is perfect! I really like your tshirt, is very original!